Overtime Scandal in the Making at DPW? The Examiner got their hands on a draft report from the city this weekend that shows serious overtime fraud at the DPW in the garbage collection division. 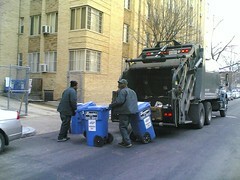 2009 showed $3.45M in overtime paid out to city garbage collectors, several hundred thousand dollars over the proper cost. The Examiner reports that four employees are at the center of the report, in charge of managing some of the distribution of overtime to other employees. The final report is due out in days, and AG Nickles has promised an investigation. This could undermine Mayor Fenty’s re-election efforts, but seeing as no one serious has the stones to challenge him, it’s hard to tell what effect it might have.